Last night was my 700th match in my MS-1. Too bad it was a loss. We took the northside. I headed for the right side road. The match started out OK – the whole team lined up on the line facing the field. Nobody thought to cover the hill area, however. I killed three suicide chargers and damaged one more, when the enemy came poking in from the hill and rapid-fired me to death. My crew continues to eke out more percentages – they are 100% camo and 72% Brothers-In-Arms. And then there was the Steam Summer sale. 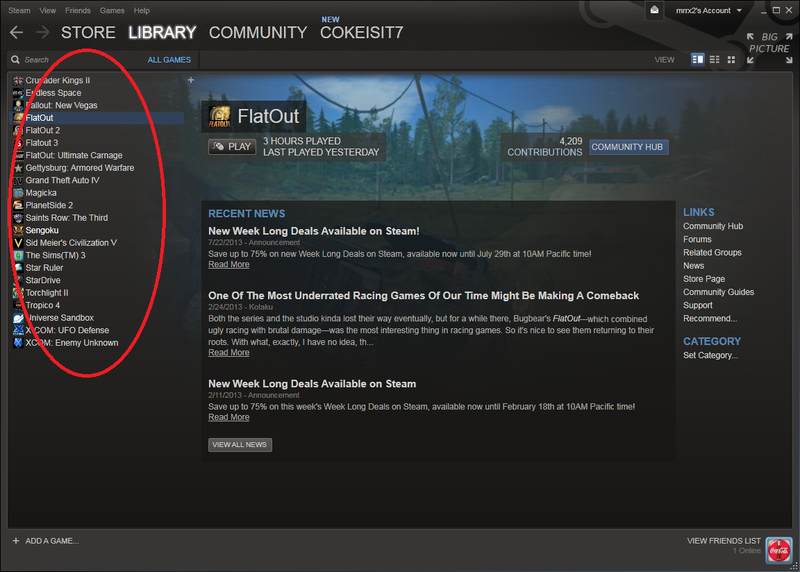 Thankfully Endless Space is not discounted, or I would be an angry camper. I am continuing to plug away on my game – my fleet is getting bigger and bigger, thankfully, since my two neighbors are getting increasingly hostile. They just unilaterally start disliking you at some point, and you can bet there will be an attack soon unless I do it first. I am stockpiling both dreadnought-class ships and small cruisers. But Star Ruler was on sale for $5, so I bought it. Didn’t play it yet. And of all things, X-COM the original is on sale for a paltry $2.49 which got me to buy it. This game – this was something I bought the first day it was available in 1999, and took a week off of work to play. Yes, that was irresponsible. But I am surprised to have found it so much fun to start up again. First, I got reoriented to the game – I remembered it well, but not exactly all the little things you need to take care of. The controlling of the big-ball-earth feels ridiculous in the era of pinch-touch mobile devices, but I can live with it. I intercepted one UFO and managed to get my entire landing party of rookies killed. This convinced me that I’d better play a game for awhile first at the easiest difficulty. The next set of soldiers fared better (only one alien to kill) but then the computer locked up and the entire game is lost. Thinking tonight I’ll start a third game (and save often). Have to grab some screenshotting software as I don’t think the game has one native. How primitive ! 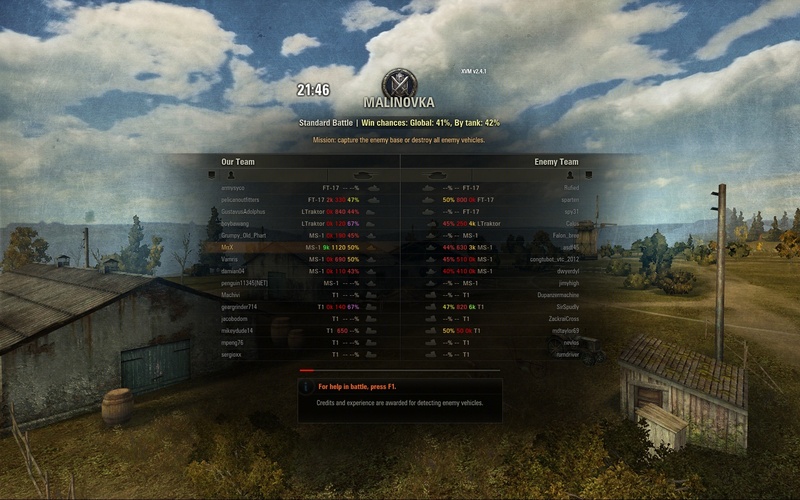 Last night was several World of Tanks matches. I think I can understand why the T-28 is getting nerfed. I haven’t played the thing for quite some time, but I started doing matches with it again and rocked the house. Three different 5 kill games, and killed quickly twice; glass cannon all right. I finally stopped doing matches with it and broke my usual rule of “Play wins over and over; switch tanks when you lose”, because otherwise I would never have gotten matches in my other tanks. 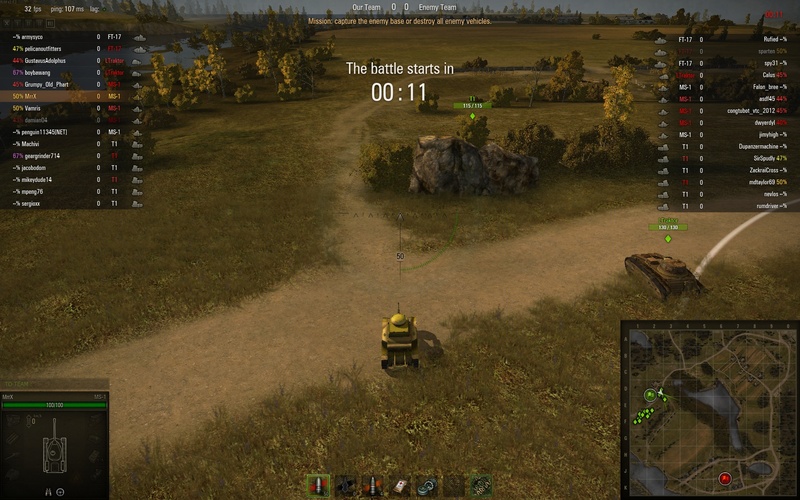 Note that this observation will not stop me from from playing matches in this tank under 7.4. I will enjoy it while I can. Started my grind up the French light tank tree with the Hotchkiss, and got in two matches. It sucked. This is not surprising with a 50% crew who I will not be training since they get tossed once I unlock the T3. 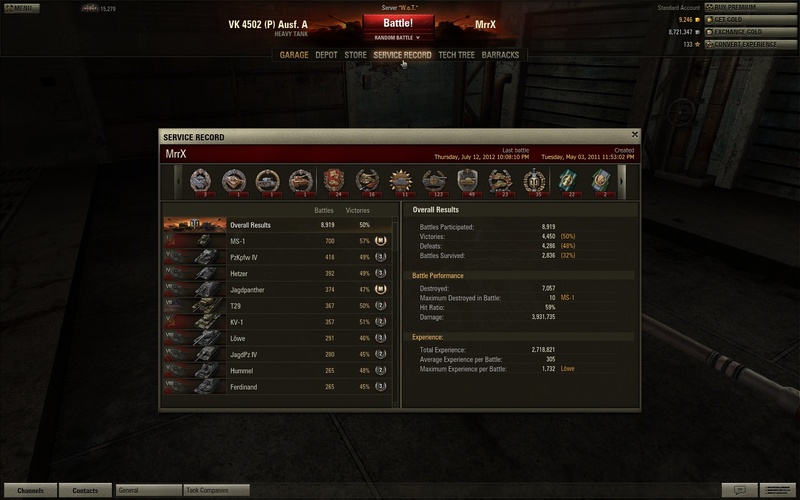 Had a lot of fun with all my primary tanks, except the KV-3 which lost all three matches. And then today I get word that this tank is getting a significant repair buff in the next update. I may just want to set this one aside for awhile as I will still need a crazy number of matches in it to unlock the KV-4. 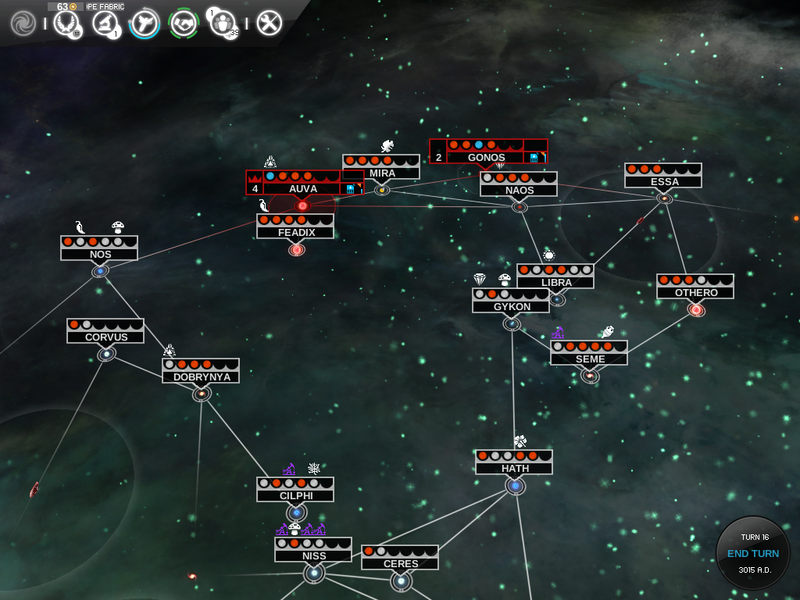 Played a few more turns of Endless Space as well. Building up my fleet after getting a lot of builder-type tasks done. Two enemy empires bordering me that I need to be careful of. I went ahead and bought Endless Space. I’ve been playing a few games in order to kind of get the idea of how it works. I know – It’s a 4x game, what’s to figure out ? Well, the flow of this game and the specifics are a bit different than I might have expected. But the first thing to be said about this game is the visuals are beautiful. One thing I noted was the builder versus conqueror playstyle, and how they apply to this game. I tried being a 100% builder – the galaxy was blocked off via two connections, and I just colonized everything on one side and left the other guy alone. The next thing I knew, he declared war, and took two of my most important systems from me. This is even on Newbie mode ! Another thing to note is the idea of terraforming your planets. I did not fully explore the tech tree yet, but it seems that transforming your Lava planet is not usually going to be advisable. All of my systems had horrible approval ratings (at Strike level much of the time), and yet if I transformed my Lava planet to some other type, I was going to take a popularity hit. Permanently. So that wasn’t going to happen. Seems the important thing on a builder level is FOOD. Get more food, build more items, and increase your system population. Become a huge powerhouse through population management. I have started my 3rd game with the race Sophons (The geniuses). This game will involve building many more ships than my last – I think I wrongly assumed that ships would cost a lot and therefore it would be useful to have fewer. The best defense seems to be staying on the offensive, but we’ll see. 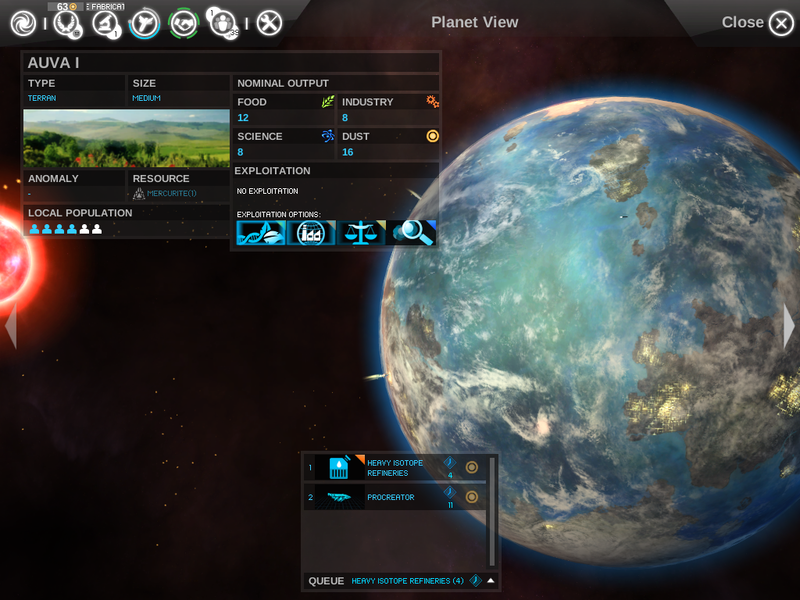 The galaxy at the start of the game. Planning to spread out like a virus as always.